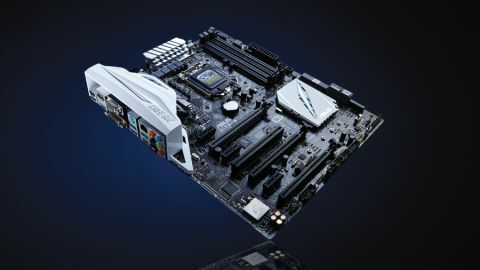 All the Intel Z170 motherboard you actually need? It's a relatively no-frills motherboard, but given its price point, the Asus Z170-A is an impressive performer and a worthy purchase. Remember when life was simpler? When there were only a few kinds of coffee? When the lower orders knew their place? And when a USB port was just a bloody USB port? Well, wake up and smell the bandwidth because things have become an awful lot more complicated. Enter the Asus Z170-A and its plethora of USB ports. Part of the problem is avoidable and entirely the fault of motherboard makers. You see, they've taken to dressing up the USB 3.0 5Mb/s standard as USB 3.1 gen1, at the same time as calling what used to be USB 3.1 10Mb/s, USB 3.1 gen2. It's all baffling and making a bad situation worse. Check out the rear panel on the new Asus Z170-A. It packs no fewer than three different types of USB ports. You've got your common or garden USB 2.0 ports. Then there's some USB 3.0 ports (or USB 3.1 gen1 ports if you're a silly mobo maker) and a lone USB 3.1 socket. Rounding it out is the real newbie, a USB 3.1 Type-C port, which is much smaller than a standard Type-A port and reversible, which means you can just stuff the connector in and it'll work, like Apple's Lightning connector. Of course, that USB complexity applies to all of the Z170 boards we've seen. So what marks out Asus's Z170-A? Not its build quality, that's for sure. The PCB is skinny and cheap looking. A bit of white plastic surrounding the panel of rear ports doesn't change that. Actually, it probably wouldn't hurt airflow to get rid of it. It's not exactly bursting with features, either, though the price point (£117 – around $180, or AU$250) makes that inevitable. Frills like LED debug displays, power and reset buttons, switches to toggle auto-overclocking – none of that appears. On the other hand, the Z170-A delivers pretty well on the stuff you actually need. Apart from all those USB ports, there's an M.2 slot for super-speedy SSDs with NVMe support. The PEG-16 graphics slots have support for both Nvidia SLI and AMD Crossfire multi-GPU graphics, too. Look even closer and you might spot the dedicated header for a CPU water pump, which is genuinely useful now that water cooling has become both mainstream and relatively affordable. Chuck Asus' fantastic UEFI BIOS interface into the mix, then, and you have a strong all-round package, especially if you're the sort that tends to build a PC, close the door and just get on with it, rather than someone who likes to gaze lovingly at LED-lit innards through a window. That applies when you take performance into account, too. At stock clocks, with an Intel Core i7 6700K on board, the Z170-A trades blows with MSI's much more expensive Z170 Gaming M7. It's millimetrically behind in Cinebench (scoring just one point less than the MSI effort, which hit 915), and x264 encoding (being 1 fps slower), but marginally ahead in Shadow of Mordor (1 fps faster in this case, both for minimum and average fps). Even more impressive, given the Z170A's price point, is its overclocking prowess. It achieves exactly the same 4.7GHz overclock as the other Z170s we've seen, including MSI's Gaming M7. What's more, like every other board, that 4.7GHz can be achieved using either the 6700K's unlocked multiplier or via the baseclock. With an unlocked chip like the 6700K, you may as well use the multiplier. But the baseclock performance bodes well for possible future Skylake processors that may come at lower price points. The age of clocking the twangers off a cheap CPU may be about to return. If it does, it makes sense to have a cheap motherboard capable of decent overclocks itself. The Asus Z170-A wouldn't be a bad choice.